Frank has given us ROCK as our theme this week. Living in a holiday resort, naturally there is Holiday Rock available to buy all year round. We have a variety of flavours, including Gin and Tonic, though from what I gather, you don’t have to provide ID to buy it! We have an abundance of shells on the beach, several of which I’ve put on our little display case. Maggie once found a rock which she was fascinated with so I brought it home and put it in the back garden. Hubby bought me a Peace Rock for Christmas, which is beautiful. A large pebble decorated with coloured glass, that too is with our shells. 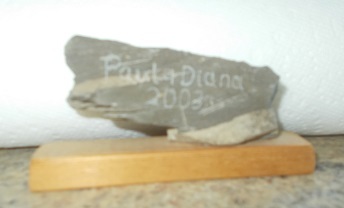 We found it in the car park when visiting a slate mine in 2003. To buy something similar was upwards of ten pounds, which for what it was seemed a bit of a rip off. We don’t mind paying a little bit extra for something unique to commemorate a memory as we did with Hedgie there, but I think Hubby’s plinth looks OK don’t you? This entry was posted in blogging, Challenge, Photos and tagged fpj-photo-challenge, photo challenge. Bookmark the permalink. Do you not add Roll to your Rock? OMG I forgot any rock candy. We would get the one with the colours of the Irish flag.